Days are longer, sun is hotter, sailing weather is here! So I went ahead and bought a Sea Pearl 21. This is "Scout" and I am her new custodian. She does NOT replace the Goat Island Skiff, but she augments it. I have found myself either pondering or actually undertaking passages that were a tad too oceanic for the Goat, and then there are days when I want to cruise and not be cramped, or take out several adults. Enter, Sea Pearl 21. 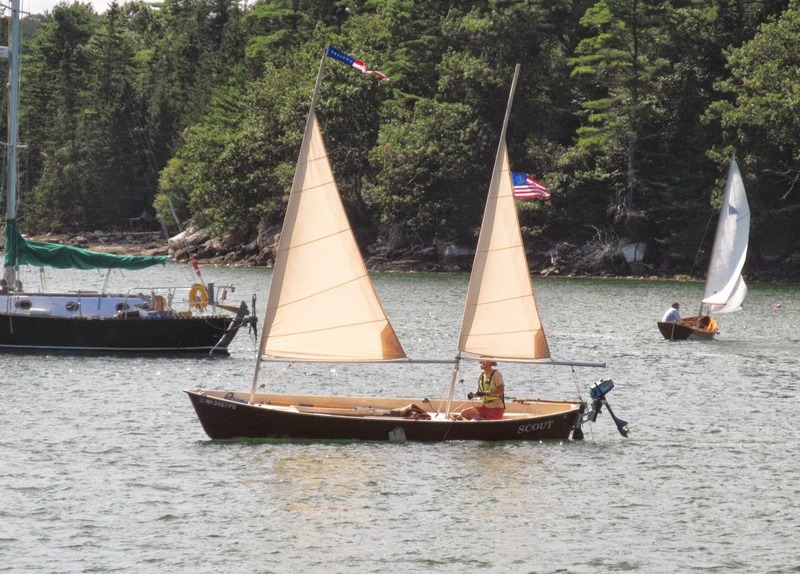 Look, the Goat Island Skiff is obviously a fantastic mostly-sheltered water cruiser, as evidenced throughout this blog. I would also say it's a squeeze for two people and 5 days of gear, and it's a little hairy 6 miles offshore in the Atlantic. I wanted something that was a little more seaworthy if I was alone and undertaking an adventuresome passage, and I wanted something I could sleep in, or take several adults for a day cruise. I do lose the easy ability to move the boat around on my own, since the Sea Pearl weighs in around 650 lbs, but I gain some other things. Hence, the Goat Island Skiff and the SP21 are boatmates and will compliment each other in such a way that there won't be too much stepping on anyone's toes. NOW, do I post Sea Pearl 21 adventures on this blog or do I post them on another dedicated blog? What sayeth you, intrepid reader? Not as attractive as the Ohio Sharpie, but probably more seaworthy. Good pick. For my money, I think she deserves her own blog. Plus, if you start spending too much time in Scout and not enough time in IAZP, it will show in the blog and you will feel great remorse and will be compelled to return balance to the fleet. I agree - a separate blog for Scout. Awesome! Expecting epic advenure reports. The one or two blogs is a tough one. I went with one just because it's less to maintain and easier for others to find you if all your stuff is in one place. Look, I hate to badmouth a boat as popular as a Sea Pearl, but I would not take one offshore myself. Do some capsize tests before you do. I think you will find, as others have, that the boat cannot be recovered once swamped and must be towed to shore before it can be sailed. If you call that "seaworthy" fine, but I don't. The Sea Pearl has many things to recommend it but seaworthy is not one.